Andrea’s work is amazing! From the moment she drew up my idea, I never had to worry about my cake again. She is so professional and had everything taken care of on time and without me having to double check with her. 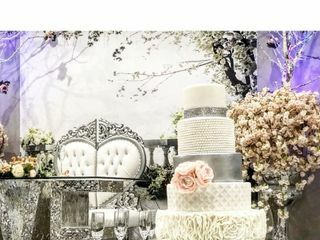 I was looking for a wedding cake but could not find what I was looking for until I found Andrea Howard cakes, she has been my cake decorator for every special event since then. Not only they are delicious, she is very talented and makes everything look nice and neat.! Not only did our cake look absolutely beautiful, it tasted just as good! I have never been a cake eater, so when I say we are cake everyday for a week after the wedding... it means A LOT! We had two tiers of red velvet which was perfectly rich and three tiers of the pink champagne which is the best cake I have ever eaten. Thank you so much for making our dream cake better than we could have ever imagined! We will be using you for ALL future cakes. Andrea was amazing to work with! She was very professional and prompt to answer and set up a consult. Everything was great, from the tasting to the delivery or the cake, she made my dreams of a wedding cake come true! Absolutely love everything she did! I am very pleased with how my experience with Amanda went! She knew exactly what I wanted and made my dream wedding come true!! She has unique flavors & I would 100% recommend her to other brides or customers!! 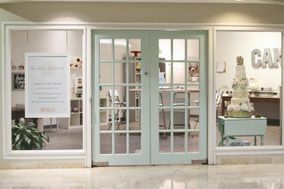 Andrea Howard was recommended by our wedding planner. When we met I through a few ideas at her and let her run with it. It was the best decision I ever made. 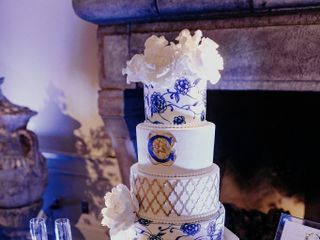 The cake was absolutely stunning and a huge hit at our wedding. Our wedding cake was so beautiful and tasted wonderful! I highly recommend Andrea! Andrea makes the most delicious cakes I’ve ever had. We got so many compliments for our wedding cake! Not only are they tasty but beautiful, too. She was very prompt with any questions or concerns that we had, and polite and sweet to speak with. Highly recommend the strawberry cake, that was our favorite flavor!! Andrea was the best choice EVER for cake!! I don't generally like cake or baked goods much but omg this was the best cake ever!!! After the tasting with her, I knew I wanted her cake at our wedding. Each type we tried was soooo yummy, it was hard to choose just 2, was a small wedding!! I generally find buttercream too sweet for my tastes but it was amazing!! We had a layer of devil's chocolate and one of the vanilla w/raspberry buttercream filling and it was to die for!!! Everyone loved it! So happy we went with her. At the tasting, she really understood the simple and classic style I wanted and nailed it, it was beautiful! Can't wait (and if I find a good excuse not too, I won't) for our 1-yr anniversary to order another one, I could eat her cakes for breakfast, lunch and supper!! Will post a photo as soon as I have one!! Thanks Andrea, it was beautiful and sooooo DELICIOUS!! Our guests LOVED the cakes! Not only were they beautifully made, they were delicious. I would definitely recommend to everyone! Andrea's cakes are absolutely amazing! They're gorgeous and they taste just as amazing! Received so many compliments on our wedding cake and grooms cake! Thank you again, Andrea! We will be using her again in the future! Our wedding coordinator found Andrea Howard for us, and we are so glad she did. I couldn't be happier with how our cake turned out! It was absolutely gorgeous and delicious. Everything was perfect and even better than I had pictured it in my head. Guests were raving about it. Her quality was impeccable and the strawberry cake was to die for and was so yummy and fresh! We did rent a cake stand from her with no issues. Book her, you won't regret it! Andrea was professional easy to deal with and on time. Cake looked beautiful and tasted amazing. 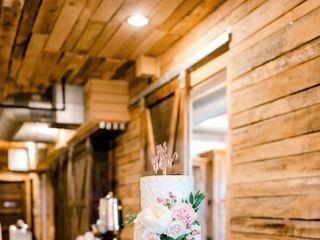 Everything about my experience with Andrea was awesome from cake tasting to my wedding day. I've never in my life tasted a cake like this one. Even my mom who is the pickiest person in the world couldn't get enough of it. On top of taste, it was made just the way I wanted it. I totally would recommend her to anyone and everyone. Andrea Howard Cakes is absolutely amazing! She is such a pleasure to work with, and her cakes are absolutely GORGEOUS! 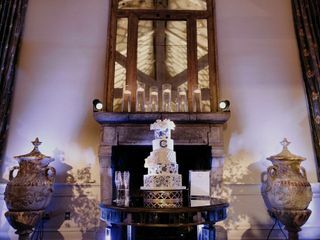 We loved our cake, and we have only heard amazing things about it from all of our guests. We chose to do cake as our wedding favor, and there was NONE left at the end of the night!! What else is great is she creates a matching anniversary tier that she boxes up separate for you so you don't have to hassle with trying to free the top tier yourself. 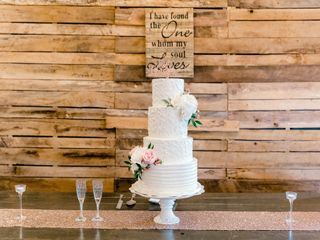 It's honestly pretty hard waiting a year, knowing we have a delicious cake waiting in the freezer for us ;) But seriously, I cannot say enough good things about Andrea - if you want the best cake for your wedding, go with her, hands down! The cake was absolutely beautiful, and was completely gone by the end of the wedding. Everyone thought it was delicious! She was absolutely wonderful! From the beginning of the planning process to the day of the wedding, she was easy to work with and made my dream cake come to life. I have never tasted a more delicious strawberry cake in my life! She was a big help with getting bases for the cakes and provided boxes for leftover cake. She was quick to respond to questions, and was on time and prepared for any appointments and everything was delivered promptly the day of the wedding. Prices were reasonable too. I would highly, highly recommend her! Andrea's cakes are absolutely amazing! Not only are her creativity and design quality unrivaled, the cake is the most delicious I have ever had! I had the strawberry, lemon, and red velvet in my wedding cake, and after eating huge amounts of each I'm still not sure which was best. Andrea is sweet and fun to work with, which is a great quality for a wedding vendor! Andrea is absolutely amazing! I can't recommend her enough. She worked with my fiancé (now husband) and I and may the entire process stress free. Our cakes turned out to be so gorgeous. I can't even count the number of compliments we received. She's wonderful and you'd be crazy not to use her. I cannot say enough wonderful things about Andrea Howard Cakes! Andrea was a delight to work with, from our initial cake tasting appointment, to providing a cake stand for us to use last minute. There was a threat of severe weather on the day of the wedding, and several road closures due to flooding. Not only did Andrea arrive on-time, she personally arranged the fresh flowers on the bride's cake and double checked to make sure we were pleased. Both the wedding cake and the groom's cake were moist and delicious, and were picture perfect. After the wedding, I mentioned to her that my daughter and son-in-law were disappointed that there wasn't any cake left over (they only had a bite following the cake cutting picture). Andrea created a mini version of the top tier that we surprised them with upon their return from the honeymoon! I would highly recommend Andrea Howard Cakes for any special event! Andrea was FABULOUS to work with. Her cakes are BEAUTIFUL and DELICIOUS! We literally had 3 pieces of cake left over after the wedding. Everyone at our wedding kept asking us, and my parents, who made the cake because it was so beautiful and yummy. Andrea was so easy to work with- filled with ideas, and let me completely change the cake 3 times ha! We ended with a 4 tier cake and each layer has a different design and different flavor. I can't wait to use her again for a birthday cake in the future! BEST. CAKE. EVER. But really, Andrea was so easy to work with! We literally met with her only once before our wedding, and other than checking in a couple weeks before our big day, we didn't have to do anything because I knew she had it under control. I loved ALL of the flavors we tasted at our appointment. I don't think you can go wrong with any of them. Pink champagne is the best though! 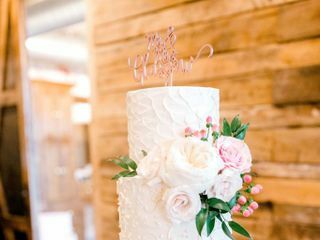 I didn't want a huge cake because I don't love the look of them, but we had a 350+ guest list, so to Andrea created the perfect dainty three tier cake for me, a two tier cake for the groom's cake and then baked and iced sheet cakes just as pretty and delicious as the big cakes. 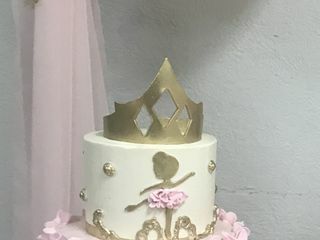 Also, we wanted to be able to serve the top tier of my cake, so she created another cake that looked like the top tier and delivered it in a box ready to go home and go in the freezer. I can't wait to eat it on our first anniversary in January! Oh, and she brought our cakes from Edmond to Ardmore just a couple days following a huge ice/snow storm, so it wasn't the best of road conditions. I had been a little nervous about our vendors not being able to get here, but she came through! Andrea did such an incredible job on our wedding cakes! I am so picky when it comes to the look of cakes and it could not have been any more perfect. The details were amazing and most importantly it was SO delicious! I can't even tell you how many compliments we received on them! Very accommodative with schedule, theme, everything! Can't wait to have our anniversary so we can have the cake one more time!